Fresh from 2018 Music & Media Festival South by SouthWest (SXSW), the UK welcomes anticipated appearance of American keyboard player, record producer, songwriter and independent R&B soul artist, Micki Miller, with Live Band!! 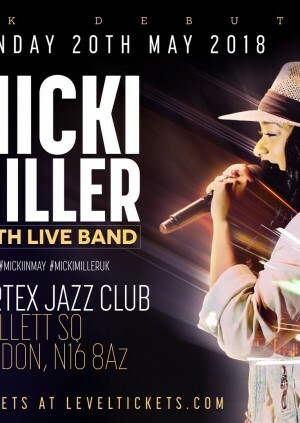 On this first cross Atlantic debut Ms Miller will be accompanied the musicians featured on her last album 'Micki Miller LIVE', Turnell O’Neal (Keys), Derrick Hines (Bass) and Redginald “Wally” Norris (Drums). A resident of South Bend Indiana, Micki Miller grew up playing music since the age of 6 under the wings of a musical family in church services. She soon became the main keyboardist to her older brother, Grammy nominated Gospel Artist, Pastor Jonathan "YPJ" Miller. Her talents have kept her active with collaborations, songwriting and production projects which includes her personally releasing five music projects since 2013. Her 2016 project Summertime Chi, reached number ten on the iTunes R&B and Soul Charts with public endorsements from Taraji P Henson, Quest Love & James Poyser of the Roots, DJ Jazzy Jeff and other signed and indie Artist. December 2017 - Chicago's top soul music artists performing live in the studio, monthly. Providing Artiste Services, Promoting Music and Presenting Events & Tours.